Developed by Flyhigh Works and published by Circle Entertainment, Witch & Hero II is a fantastic tower defense / roleplaying game that is great fun in small doses, but is it fun enough to keep you coming back for more? Continue reading our review to find out the answer to that question! 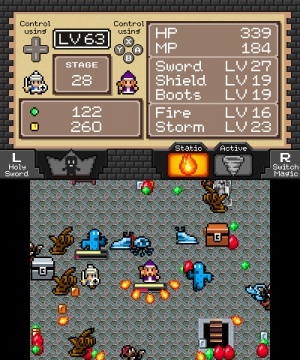 The gameplay in Witch & Hero II is a unique blend of roleplaying and tower defense with a bit of strategy genre thrown into the mix! Your hero must run into enemies to damage them, YS series veterans will feel right at home with this formula. Your hero is immortal so he needs to protect the fragile witch who has extremely low defenses or it's game over! On the flipside the witch has incredibly powerful and useful magic that can help clear out enemies so careful strategy is key to beating each of the game's many stages! The game is separated into stages and though it starts off easy it quickly becomes incredibly challenging! 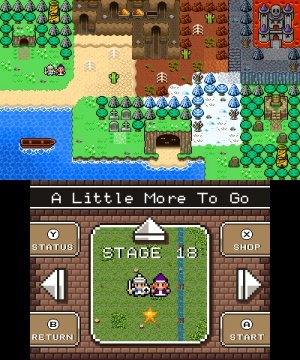 Witch & Hero II is a fairly short game and can be beaten within six hours or so, but it's great fun! A little warning though, you might want to limit your gameplay sessions as the game can get very repetitive during longplays of the game. In-terms of controls they are very solid and quite intuitive in this game which is always a good thing! Visually Witch & Hero II looks nice in a very retro way with excellent 8-bit backgrounds, dungeons, characters, and enemies the game just oozes with retro goodness! The soundtrack is also decent, but not all that memorable, regardless it gets the job done! 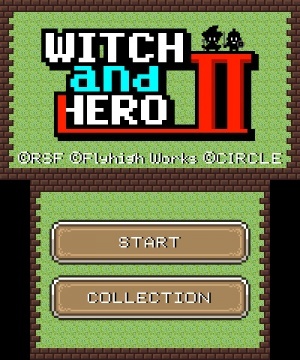 With unique and solid gameplay, excellent controls, and gorgeous 8-bit visuals, Witch & Hero II is a fantastic blend of unique ideas that are decidedly refreshing, however an unmemorable soundtrack and repetitive gameplay hold the game back from true awesomeness. Nonetheless Witch & Hero II is still a solid title that we recommend to any fans of RPG's and the strategy genre! Great review! Witch and Hero 2 is a very fun and quirky game.